The capacity factor is the average power generated, divided by the rated peak power. Let’s take a five-megawatt wind turbine. If it produces power at an average of two megawatts, then its capacity factor is 40% (2÷5 = 0.40, i.e. 40%). To calculate the average power generated, just divide the total electricity generated, by the number of hours. 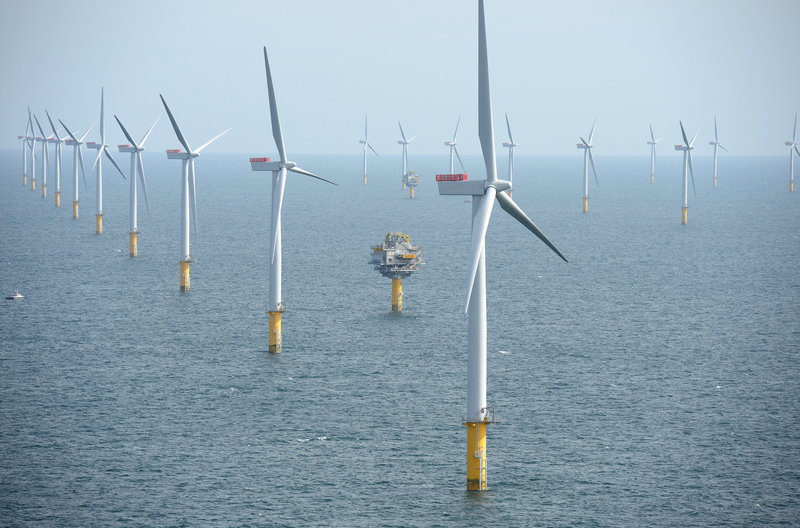 You can find the capacity factors for Danish offshore wind here; the capacity factors for UK offshore wind are here, and here are the capacity factors for German offshore wind. You could do an equivalent calculation for a car. Let’s say your car’s top speed is 100 miles per hour, and you drove 240 miles in a day. There are 24 hours in a day, so your average speed for the whole day is 240÷24 i.e. 10 miles per hour. And so your car’s capacity factor for the day is 10% (10÷100). That’s different to the average speed for the journey: the calculation includes the entire time period – the whole day – not just the length of the journey, and not just the time when the vehicle was moving. It’s just the same for the capacity factor of a power station, whether it’s a windfarm or any other kind of generator: it includes the entire duration of time in question, not just the time it was in full working order, and not just the period it was actively generating. Now, given that you drove 240 miles in a day, you probably spent very little time driving at 10 miles per hour. And you probably spent very little time driving at the car’s top speed either. The 240 miles you travelled were made at a wide range of speeds. It’s just the same for turbine output: a turbine might spend very little time at its average output, and some of its time at its peak output, and some time at other values; and, for a typical onshore turbine, about 20% of the time at zero output, of which about 19% would be because wind speeds are too low or the turbine is offline for maintenance, and 1% would be because wind speeds are so high that the turbine has been shut down to protect it. 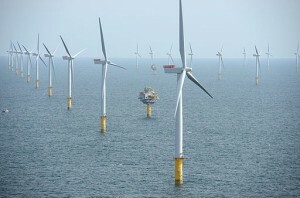 The capacity factor of a windfarm is a design decision. Shocking, eh? It’s not something that “just happens” to the wind turbines, it’s a design decision. For any given decent wind site, the developer could choose turbines that would give a capacity factor of 1%, or a capacity factor of 80%, or anything in between. It’s an economic decision. Yes, over a minute or a month, the weather is the primary driver of the capacity factor; but over the 20-30 year life of a windfarm, almost all those weather variations will average out, leaving a capacity factor that’s almost entirely driven by the windfarm developer’s trade-offs between the costs of blades and structure; the cost of the mechanics and electronics in the nacelle; and the cost of the grid connection. The longer the blades, the more expensive they are, but they can harness more wind to generate power. The lower the maximum power rating of the electrics and electronics, the cheaper they are, and the cheaper the connection to the grid will be. So, a developer could choose a turbine with very long blades, and very low rated electronics, so it would generate its peak rated power pretty much any time when there was more than a breeze, and that would result in a capacity factor at a typical onshore wind site of about 80%, but it would deliver much much less electricity almost all the time. On the other hand, at the very same site, the developer could instead choose to have shorter blades, and electronics and grid connection rated at a very high power. In this case, the turbine will never generate its peak power, and the average power generated will only be 1% of the rated power: and the electricity it generated would be at a much higher unit cost. Identical site, identical winds – but different design decisions can lead to capacity factors of 1%, or 80%, or anything in between. And around 80% of the time, for a typical onshore site (higher for offshore site), the power generated at any one moment is a control decision. The maximum possible power at any one moment will be determined by the wind speed, but the actual power generated can be anywhere between zero and that value, and it can be rapidly varied up and down within that range, to provide frequency-control and other balancing services to the grid (this has been referred to in the scientific literature as synthetic inertia, and some grid controllers are already harnessing these services, allowing wind turbines to increase grid stability). Now, the capacity factor that’s actually realised does have a lot of uncontrolled factors in it – actual wind speeds, and unplanned down time – so the developer can’t determine the capacity factor to five significant figures. But over a period of a few years, which is enough time for wind speeds to average out, then the realised capacity factor will generally be pretty close to the designed capacity factor. So isn’t a higher capacity factor better? No, it’s not that simple. If we could do what economists do, and just assume that all other things are equal, then yes, a higher capacity factor is better than a lower one – but all other things vary in important ways, so that would be a useless assumption. A developer could choose a turbine that gave them an 80% capacity factor, and they might save a bit of money on buying the turbine and contracting the grid connection, but the reduction in energy generated would be far greater, so the return on investment would be much worse. The very high capacity factor would be a bad business decision, for the developer and for the energy system as a whole. So maximising the capacity factor would be a bad decision: it would be almost all the same costs, but with a lot less energy generated. The capacity factor is also known as the load factor. Here we’re considering long-term average capacity factors. Not the capacity factor at any one moment, or in any one day or year, but the long-term average over several years, to smooth out the variations due to weather and unavailability for maintenance. And just as the average speed of a car is made up of a lot of different values, and the car itself might spend very little time travelling at the average value, a wind turbine’s capacity factor is made up of a lot of different values, and might spend very little time. When I talk about averages here, I’m always referring to the arithmetic mean. If you don’t want the car’s calculation in miles per hour, just pretend I wrote kilometres per hour. Multiply all the numbers there by 1.6 if you like, but the answer of a 10% capacity factor for that car on that day will remain the same – it doesn’t depend on the choice of units. The peak power (nameplate power, nameplate capacity) is usually used to help identify the particular turbine: together with the diameter of the area swept by the blades, it defines a lot of the operational characteristics of a turbine. As of 2014, typical grid-scale wind turbines had ratings of one to six megawatts (MW), with seven- to ten-megawatt designs being progressed.